Clusters of rowan berries – but to a botanist the cluster is a corymb. Rowan berries but to a botanist - a pome. And so it is: when the small, up to a centimetre large fruit is cut in half it looks like a miniature apple and the chemical composition is similar. There are three seeds in the fruit. 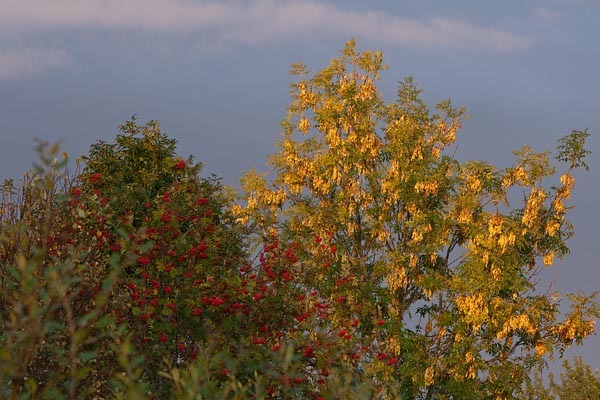 The rowan fruits become fully ripe with the first strong frosts: the taste becomes sweeter after frosts, there is less of the bitterish taste and the fruit is juicier. What happened in the berry? Under the influence of the cold biochemical changes took place: glucose and fructose was formed by hydrolysis, starches changed into sugars and changes in pectins also occurred. The amount of soluble pectin increased and the non-soluble fell. The proportions of malic acid and tannins decreased. Quite significant changes and it is noticeable in the trees – after night frosts the rowanberries suddenly turn out to be attractive for feathered and furry creatures (most interested in the fruits are brown bears and elks). 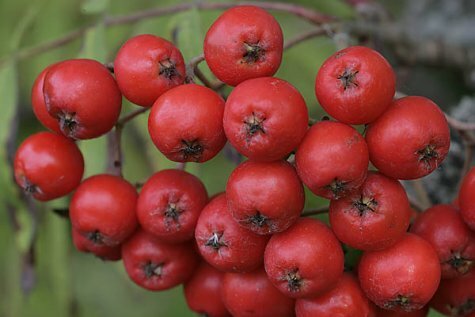 In the old days rowanberries were kept in the hay shed, the attic or in the barn. We collect whole bunches with accompanying leaves and put them in the freezer overnight, to prepare juice or syrup or leave them for using raw. Rowanberries contain large amounts of vitamins and essential substances for the body. The easiest way is to take ten rowanberries with a spoonful of honey – the size of the spoon is for the user to decide. A tablespoon is recommended.